Gifting is Back! 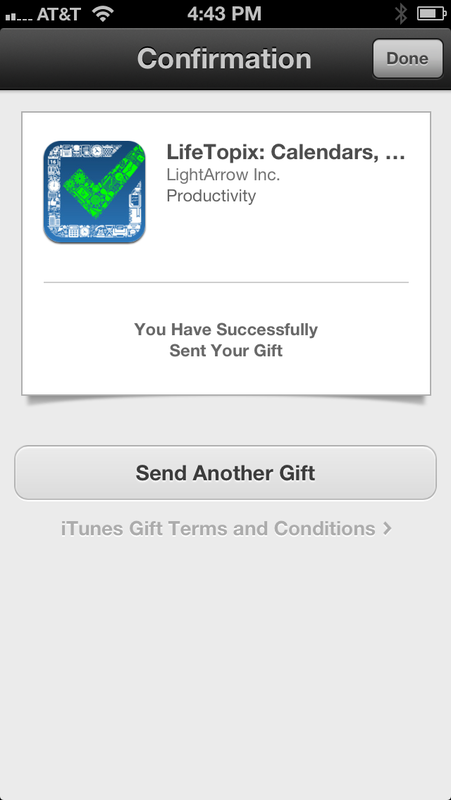 Learn How to Gift Apps with iOS 6.0. You are here: Home / Blog / iOS / Gifting is Back! Learn How to Gift Apps with iOS 6.0. On September 21, 2012, Apple stated that “Currently, app gifting is not available from your iPhone, iPad, or iPod touch with iOS 6. 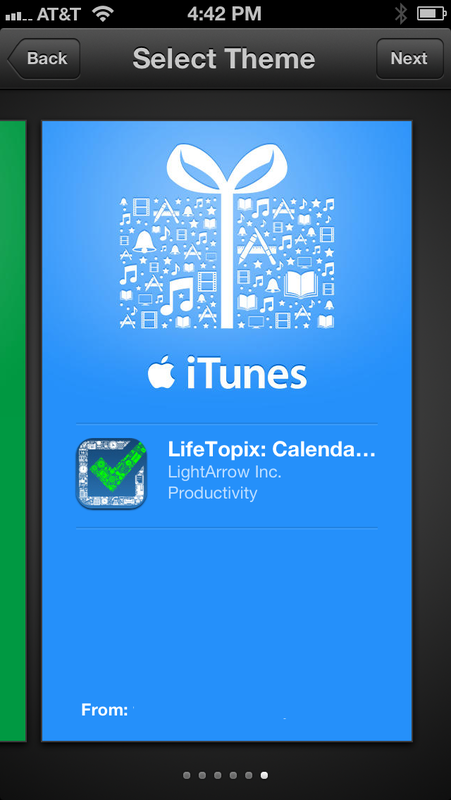 However, you can gift iOS apps from the iTunes Store on a Mac or PC.” Recently, App Gifting returned! At LightArrow, we believe it would be splendid to give the gift of productivity for the holidays so we were very pleased to hear the news. To share our excitement, we put together a post to show you exactly how it works. 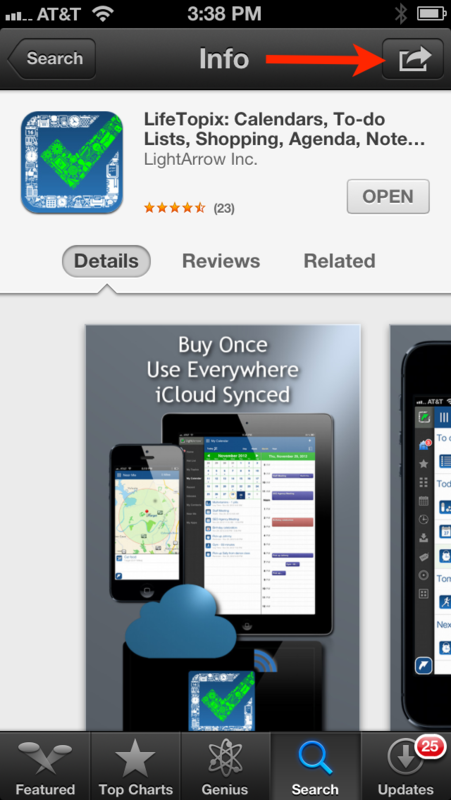 Locate the App you wish to gift in the App Store, and then tap the Share button in the upper right corner. You’ll see the following screen. Tap the Gift icon to continue. 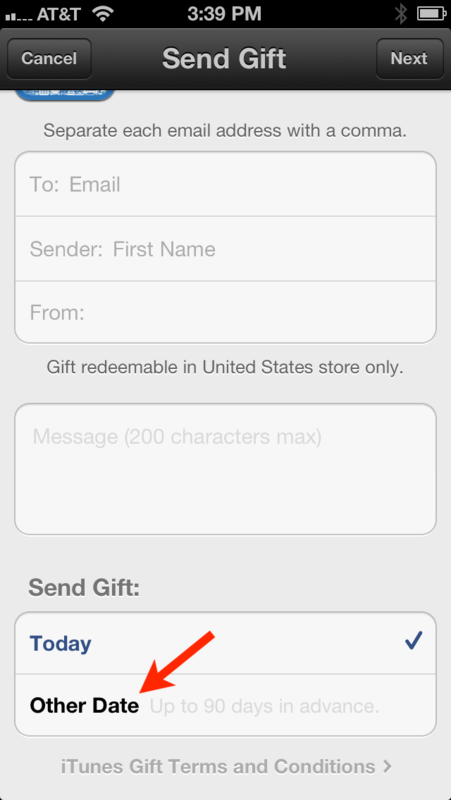 After you tap the Gift icon, you can gift the app via email. Simply add the recipient’s Email address, the Sender’s name (perhaps Santa? ), your email address, a short message, and the specific date. And just a few days ago, Apple added the ability to specify the date of when the recipient will receive the app (up to 90 days in advance). The new addition is perfect for birthdays, anniversaries, and other holidays. After you complete the fields, simply click Next. After tapping Next, you can select from a group of colorful themes. Just select a theme and tap Next. After you select a theme, your information is confirmed. Tap Buy Gift to continue. A final confirmation is displayed. Click Done to complete your transaction. http://lightarrow.com/wpcms/wp-content/uploads/2012/12/theme1.png 209 118 Marilyn Rogers http://lightarrow.com/mktgimages/lightArrowLogo.png Marilyn Rogers2012-12-17 17:21:162014-07-16 22:00:03Gifting is Back! 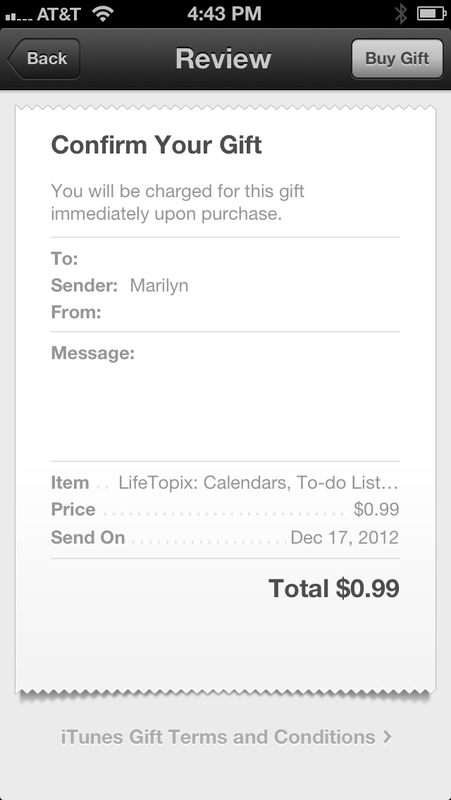 Learn How to Gift Apps with iOS 6.0. Great to have gifting back!!!! !